PERSONALISED FAMILY CREST GIFTS from Engraved Gifts Online, specialists in custom engraved, personalised jewellery, gifts and awards. Our Heraldry database contains Family Crests, Coats of Arms and Clan Badges for thousands of family and clan names, but please email us first before ordering, just to be sure we have your name. 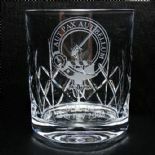 Our Family Crest or Clan Badge tankards in pewter or crystal will make the perfect gift for a man's special birthday. A Photo Frame engraved with Coat of Arms for a special wedding gift. 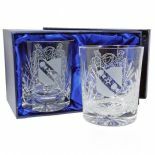 Our whisky glasses, single or pairs, engraved with Family Crest or Clan Badge, our Hip Flask or Silver Dog Tag, will be a unique and treasured gift when personalised with your Coat of Arms. Or choose from our printed china and ceramic gifts, or our Family Crest and Family History prints. Family Crest/Coat of Arms gifts for English, Welsh, Scottish and Irish surnames. Personalised with the Clan Badge of your Scottish or Irish Clan or Sept.